The reason why we localize a website is the same reason we build websites in the first place, to reach, engage, persuade, or inform an audience. We often obsess over the details in communicating with our audience and creating an impactful conversation. We think about who our audience is and when trying to reach out to a new audience-we end up not connecting with them. Sean Gottlieb is the CTO for Global Offerings at Lionbridge Technologies and builds architectural solutions via consulting services and technology to help large and small brands translate their website into a variety of languages. Lionbridge translates a variety of content including simple Word documents, voiceover for video, and websites. Sean recently spoke at the WP Engine Agency Summit and offered some takeaways on preparing your website for translations and localization. The buyer who is new to localization often has these three components that they feel are sure-fire components for rapid localization. They have an internationalized CMS: a CMS capable of publishing in multiple languages. They also have finalized content created strategically with the brand voice in mind. Finally, they have a translation agency. 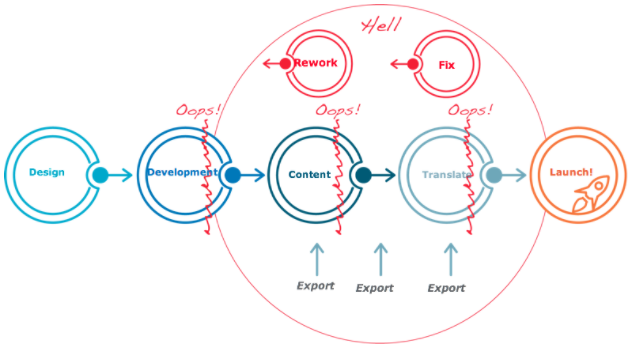 These are three ingredients of a seemingly error-free translation process. The project plan most likely starts and ends like this. You start with a design phase, complete the development, create the content, translate that content, and launch your website (with any additional tweaking). This is seemingly straightforward. The actual project probably looked something like this. Design goes as planned often times, but development can be complicated. Content can often get stalled in the process of creating and implementing. Once content is finalized, translation is often the step you expect to go smoothly. It’s at this point that you realize how ill prepared you are for localization. 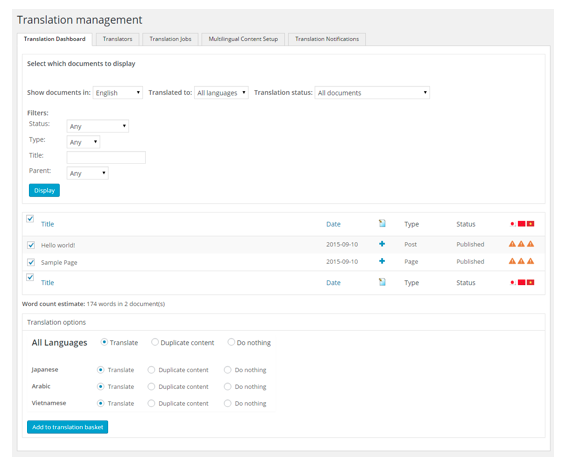 Although you thought you had an internationalized CMS capable of multilingual publishing and you have the infrastructure in place, translation can often go wrong during the implementation. There are many best practices you need to follow or will often be faced with an immense amount of work. Do You Want To Translate All Your Content? Word for word translation of content might not be wise. Not all content is relevant to all languages. Some content might only be suitable for a certain locale. For example, you might have a product you’re not authorized to sell in a certain country. You also might have low-quality, outdated content that is unnecessary. The first challenge is segmenting content so that you can only send what you want to be translated to your translator. The second challenge is to ensure that your website still looks comprehensive despite the fact that not all the content is there. One thing that needs to be considered is that it’s pretty expensive to translate text when it’s in an image because the translator has to essentially recreate that image from scratch. Lastly, a lot of localizable text is in a page that isn’t editorial at all. A lot of text, like buttons that say ‘search,’ are baked into your templates and are not managed as content. 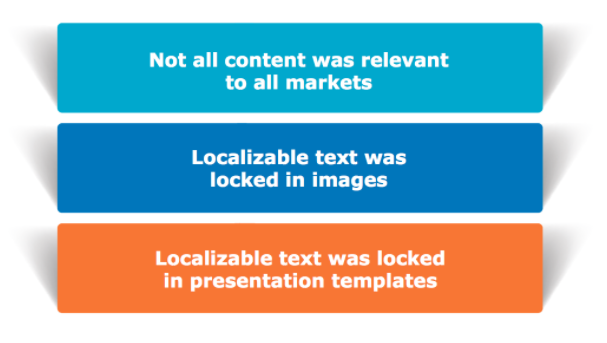 The best practice is to abstract these into localization files so that the template just calls the files that you can send over to the localization agency. This is often where the majority of time is spent during the translation process. 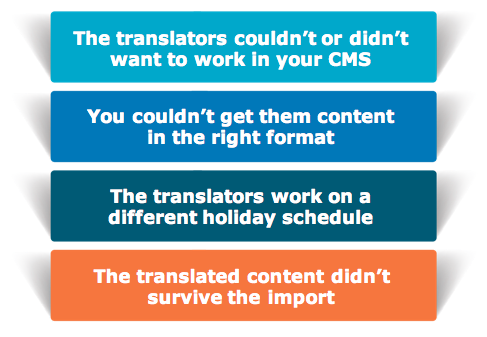 Despite having great translators, translation agencies don’t want to work in your CMS. You need to get your content to them in a format that will work for the agency rather than them getting it from you. A translator works in a highly optimized tool called a CAT tool that breaks up all the content into sentences and operates with translation memories. Another thing to consider is that all locales work according to different holidays. Consider the culture associated with the language you are translating into. 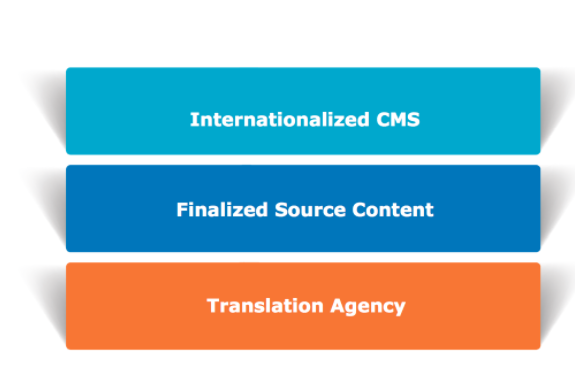 Work with a CMS that is designed for localization. WordPress definitely is and there are a number of plugins to assist you. 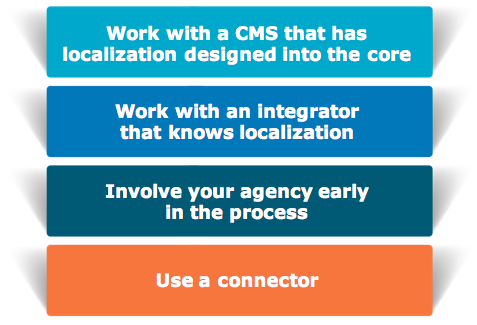 Work with an integrator that knows localization best practices and catches them early. Don’t wait until the last minute to involve your translation agency. Use a connector; WPML is go-to for WordPress. A connector allows you to select content from the website and filter it in a different way. Choose which language you want to translate, build up a collection of content to translate and automatically send it to the translator without having to create files. Once the translators are done, it’ll be displayed and you can view it in your page. A connector cuts down the propensity for human error. When following proper guidelines, your project plan will most likely look a little more like this. There are three main touch points you’ll have with your translation agency. The first touch point is when you’re done with your mockups. Your translation agency will be able to give you valuable insight on your design like what font won’t work with certain languages or what it might look like to translate to a right-to-left orientation. The second touchpoint is Global Brand Voice. In this phase, the translation agency will consult your style and language guides and adapt that to foreign cultures. Lastly, once you start generating content, you can start sending samples through for helpful feedback. During this phase, you’ll be able to tell if certain images can’t be translated. 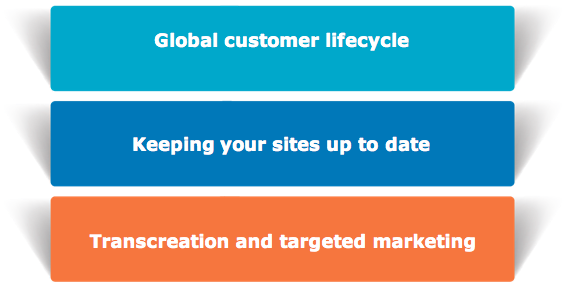 You always need to consider the customer lifecycle, even in the global market. Is your product localized? Can it be used it in the market? Do you have distribution channels? Lastly once the customer has your product, how do you stay in touch and support them? Keep your site up-to-date regularly after publication. If you are rapidly updating your home website, you need to set up a plan for updating your localized websites. Lastly, once you’ve gotten into a market, you need to switch gears. Rethink whether the market is a secondary market and start considering it as another primary market. Have a marketing team building original content tuned to the geography, events, and culture. It’s not just direct translation but it’s also transcreation: creating new things with a new locale in mind. You have to consider your strategy once you’re successful in a new market.